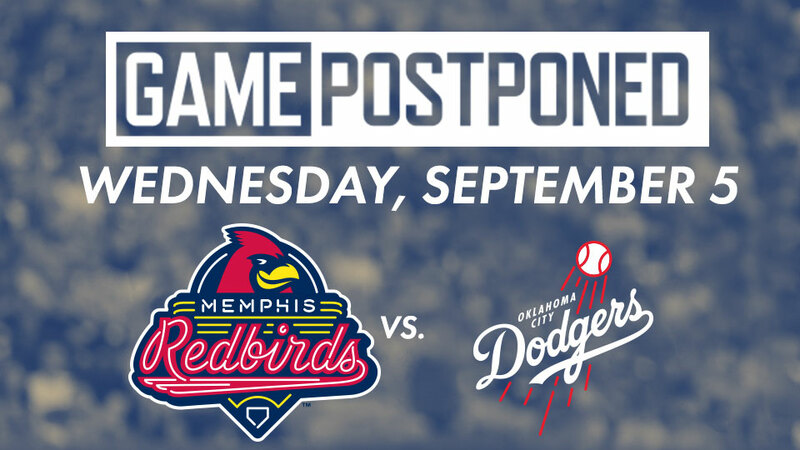 Oklahoma City - The Oklahoma City Dodgers' scheduled playoff game for tonight, Sept. 5 against the Memphis Redbirds, has been postponed due to wet field conditions. The teams will make up the game as part of a doubleheader starting at 5:05 p.m. Thursday, Sept. 6 at Chickasaw Bricktown Ballpark. Steady rain has fallen throughout the week at Chickasaw Bricktown Ballpark, and additional rain fell throughout the day today, leaving the field too wet to be prepped in time for tonight's scheduled American Conference Championship series opener against Memphis. Thursday's doubleheader for Game 1 and Game 2 of the playoff series will consist of two seven-inning games, with the second game following approximately 30 minutes after the conclusion of the first game. Gates will open at 4 p.m., and fans with tickets for Thursday will receive admission to both games of the doubleheader. Tomorrow is also a $2 Thursday, featuring Pepsi products, bottled water and select beer for $2. Fans who purchased tickets to tonight's postponed game will be able to redeem their ticket for one of equal or lesser value to Thursday's doubleheader. Season ticket holders who received complimentary playoff tickets for renewing their packages for the 2019 season, can use their Thursday game ticket for access to both games of the doubleheader. The five-game series will shift to Memphis starting with Game 3 on Friday at AutoZone Park. Games 4-5, if necessary, will also be played in Memphis Saturday and Sunday, respectively. Fans must redeem their tickets from tonight's postponed game in person at the Dodgers ticket office at Chickasaw Bricktown Ballpark. The ticket office is open through 6 p.m. today and then will open at 10 a.m. Thursday. For additional information, please call the Dodgers front office at (405) 218-2182.